Understanding how clouds affect climate is been a difficult proposition, even for a difficult to understand field like climate science. What controls the makeup of the low clouds that cool the atmosphere or the high ones that trap heat underneath? How does human activity change patterns of cloud formation? New research in Science suggests we may be nudging cloud formation in the direction of added area and height - and there may be even be a new type. It seems that, in pre-industrial times, there was less cloud cover over areas of pristine ocean than is found there today. Convective clouds forming over the Amazon in a blanket smoke. 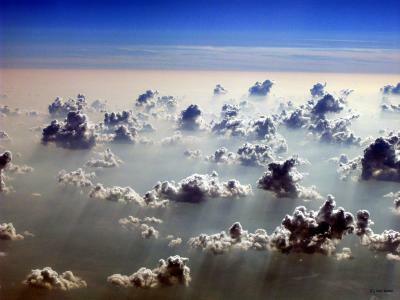 Clouds need tiny particles called aerosols that rise in the atmosphere, in order to form. These aerosols – natural ones like sea salt or dust, or such human-made ones as soot – form nuclei around which the cloud droplets condense. In relatively clean environments, clouds can only grow as large as the amount of aerosols in the atmosphere allows: They will be the limiting factor in cloud formation. The question is: Does the current load of aerosols in the atmosphere already exceed that limit, in which case adding extra particles should not greatly affect cloud formation, or do they continue to be a limiting factor as pollution rises, so that added aerosols would continue to influence the clouds? A model developed by the Weizmann Institute's Prof. Ilan Koren and his team showed that an increase in aerosols, even in relatively polluted conditions, should result in taller, larger clouds that rain more aggressively. But proving the model was another story: Experimenting on clouds, or even finding ways to isolate the various factors that go into their formation in real time, is a highly difficult undertaking. Koren, research student Guy Dagan and Dr. Orit Altaratz in the Earth and Planetary Sciences Department looked to an unlikely place to test their model: near the horse latitudes. These are subtropical regions far out in the oceans that were reviled in the past by sailors because the winds that carried their sails would die out there for weeks on end. Here was a lab for them to test the basic physics of their model: an atmospheric region controlled by well-defined meteorological conditions, which was sometimes pristine, sometimes containing low levels of aerosols. If the model was correct, transitions from one to the other should be dramatic. And they wanted to test their theory on the clouds that do form in this region – warm convective clouds that are fuelled by the ocean's moisture. With other potential factors – wind, large temperature swings or land formations – out of the way, the team could concentrate on the aerosols, comparing daily satellite images of cloud cover and measurements of the aerosol load to the predictions of the model. Using many different types of analysis, they found that their model closely matched the satellite observations. They then looked at another source of data: that of the Clouds' and the Earth's Radiant Energy System (CERES) satellite instruments which measure fluxes of reflected and emitted radiation from the Earth to space, to help scientists understand how the climate varies over time. When analyzed together with the aerosol loading over the same area at the same time, the outcome, says Koren, was a "textbook demonstration of the invigoration effect" of added aerosols on clouds. In other words, the radiation data fit the unique signature of clouds that were growing higher and larger. Such clouds show a strong increase in cooling due to the reflected short waves, but that effect is partly cancelled out by the enhanced, trapped, long-wave radiation coming from underneath.